Christian Science is at once both a religious teaching and a system of spiritual healing founded on the Bible’s universal truths. 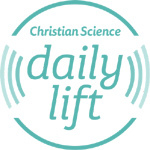 To learn about Christian Science click on the logo below. "Question. — Have Christian Scientists any religious creed? 6. And we solemnly promise to watch, and pray for that Mind to be in us which was also in Christ Jesus; to do unto others as we would have them do unto us; and to be merciful, just, and pure."